Six months ago a journalist’s murder shook the world. The world and a few of us, a poor deranged few of us, are still in shock. But on the whole life in Malta goes on as usual. We, the few, sound like old, battered records going on and on. Repeating the same thing; lighting more candles and appealing to the gods—or whoever lights the way—to conjure up something positive from this assassination. We long to learn and unlearn; learn how to truly treat democracy, unlearn the ways of the tyrants who mobilise the masses with glitz, mesmerise with golden dust and providential grandiosity. A woman was brutally murdered and nothing has changed. The attacks on her, her close family and her defenders go on unabated. Who in government cares about the significance of this murder? She reported things so she deserved to die. She was no saint, no Madonna tad-Duluri, so does not deserve to be remembered and commemorated. The world—or those parts of the free world which truly believe in free journalism and not just in paying lip service to freedom of expression—is still aghast and heaps honours on our own dead journalist. Dead? Killed; assassinated; silenced. The underworld did not like her speaking out, so she was bombed out of existence. And who now fights on her behalf? A few malcontents who see in her silencing a creeping takeover by the underworld and its close connections to people in power. The underworld did not like her speaking out, so she was bombed out of existence. The only thing that matters to the authorities is that they have apprehended the ones who pressed—or allegedly pressed—the buttons that set the bomb in motion and silenced forever the voice of our only investigative journalist. In a land which was the envy of many, all has now turned upside down. Rather than those in power uniting to find out what happened, why it happened and what facilitated this heinous crime, we have near-perfect collusion between the two main parties to keep silent about the Daphne murder and the Panama Papers. Barring Simon Busuttil and a few other brave men we would face deafening silence. The silence of the damned; the silence of those who do not wish to unearth too many horrors and connections to the underworld. Simon Busuttil sounds like a voice in a wilderness, a voice which, in his fight to clean out politics, sounds ever more like a lost Don Quixote. Having high moral standing has practically become a lost cause. 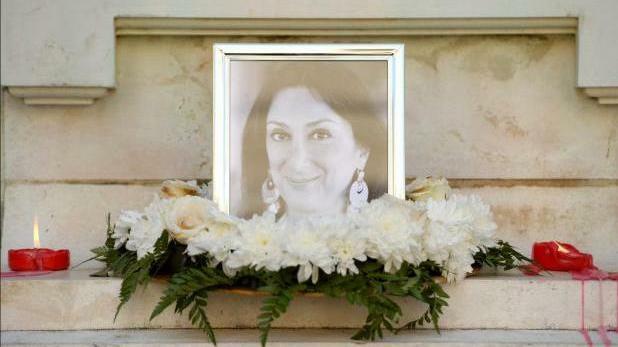 To Simon Busuttil and the other lone fighters, to all the ones fighting to remind us all that Daphne Caruana Galizia must not be forgotten I say thank you, thank you for the flicker of light you are shedding in this dark hour for our country.